The way corporate institutions have been fueling the climate crisis has to stop. 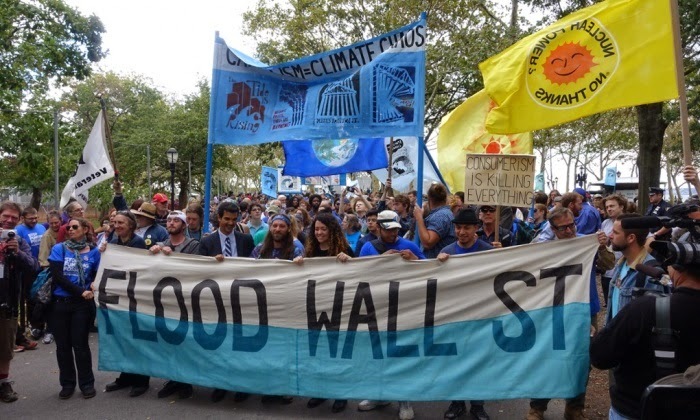 So say Manhattan protesters who marched through the city’s financial district recently as part of #FloodWallStreet. In their desire to disrupt businesses from going about their daily tasks, residents met up at Battery Park, marching toward Broadway and Wall Street. They stayed there until asked to leave; around 100 individuals were arrested. News reports indicated that around 1,500-2,000 people took place in the march. Traffic on Broadway came to a standstill and three buses were trapped amidst protestors who refused to move. Hundreds of protesters marched through Manhattan's financial district Monday, determined to disrupt what they call "business as usual" in the corporate world. Many of the protesters had also taken part in Sunday's climate march that snarled traffic throughout the city. The demonstrators are protesting what they say is corporate and economic institutions' role in the climate crisis. They gathered at Battery Park and headed up Broadway towards Wall Street, where they said they planned to remain until being forcibly removed, and said they expected to be arrested. Police wouldn't give crowd figures but it looked about 1,500 to 2,000. "The turnout today has been great. I'm actually surprised we've gotten this big of a turnout. It's fantastic. We're keeping the street right now," said protester George Machado. Their targets were Wall Street and big polluters. "Fossil fuels is burning up the planet. So that's why we're here," said the Green Party's Howie Hawkins. But after awhile it was obvious traffic on Broadway couldn't move an inch, with at least three buses stuck in the middle of protesters who wouldn't budge.